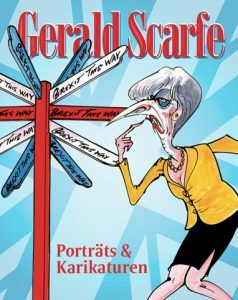 A large retrospective exhibition of Gerald Scarfe’s political work has now opened at the Wilhelm Busch Museum in Hannover, Germany. Around 120 of his extraordinary drawings are now on show until 12th August. A catalogue of the exhibition is also available to order from the Wilhelm Busch Museum.